A lot has been written in the Irish media this week about Jedward being dropped by Sony and signed by Universal. I really felt that Louis Walsh knew exactly how the contracts would play out and the story got extra coverage because of it, the clever businessman that he is. There has been a huge amount of positive media coverage of John & Edward in Ireland since they were on The X Factor. They are perfect for a children's TV show but as a pop act I've always thought they were dreadful. The argument is, as made by Louis and the media that children love them, is one that wears thin quickly and is an excuse for praising little talent. Of course there are pop acts over the decades that have became famous on that aspect of little talent but even the biggest chancers of pop could sing, dance or act a little bit. I actually liked Ice Ice Baby when it was originally a hit for Vanilla Ice. There is a mash up using Under Pressure that I have meant to post over a year now. It's a mix of the song with Michael Jackson's Rock With You. I think it works well and is featured below. Like every mash up I post I know not everyone will like it. I have to admit that I love it when people like the songs I post. John of Pop Music Notes in particular has posted some lovely comments here recently. A few posts ago one of my favourite bloggers Yuri said that a Toto song I posted was 'horrific'. That made me smile and laugh. It summed up for me what pop is. In two words pop is personal taste. I also love it when bloggers don't always like other pop bloggers favourite songs or stars. I love the fact that Paul of Fizzypop isn't Gaga's biggest fan despite the myriad of pop he likes himself. I think the worst thing that bloggers can do is agree with someone else when that person is criticising a pop star even though they may actually like the song or album in question. It does happen. I know I like the pop blogs I read every week such as John's, David's, Paul and Yuri's because they believe in and love the pop they tell the world about. As my friend Susan says 'Write for yourself and if anyone else likes it, then, that's a bonus'. Writing my blog is like being back in 1984 again except this time I know people who like the sort of pop I've liked all my life. All the pop I have loved over the last few years is just a variation on the songs I liked as a teenager. Music can be an insular thing but writing about and sharing what you like changes that. I haven't really being listening to new chart songs recently, I think I lost a bit of interest when I wasn't allowed to write about the Irish charts. In the summer I will have more time to listen to new music and I look forward to that. Anyway! Here's today's song. 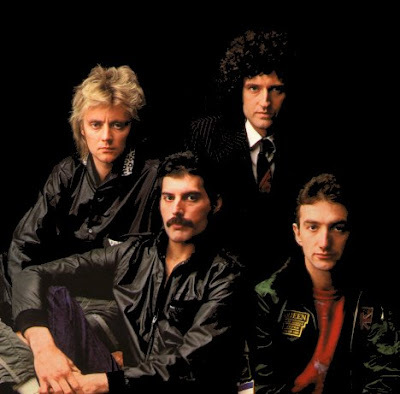 Queen & David Bowie's Under Pressure meets Rock With You by Michael Jackson. This one is for John.